Earlier blog posts have explored the lives of two Porter County citizens that served leadership roles during the Civil War. Colonel Isaac C. B. Suman would return to Porter County after the war, founding the small community of Suman and later serving as mayor of Valparaiso. Colonel Gilbert A. Pierce would also return to Valparaiso after the war, but then become a newspaper editor in Chicago, the territorial governor of North Dakota, North Dakota's first United States Senator, and later the Ambassador to Portugal. Upon his death in Chicago in 1901, Pierce's remains would return to Porter County be interred in Adams Cemetery in Morgan Township. One Porter County citizen, Robert Alexander Cameron, was a true Renaissance man. Cameron was a farmer, educated physician, newspaper editor and publisher, legislator, soldier, inventor, community founder, retailer, suffragist, postal inspector, and state prison warden; it is rather astounding how many accomplishments Cameron achieved during his lifespan of 66 years. Cameron, like Suman and Pierce, would return to Valparaiso at the conclusion of the Civil War. Photograph of Robert Alexander Cameron, circa 1860s. Source: Find A Grave, Memorial No. 5893923. Cameron was born in Brooklyn, Kings County, New York, on February 22, 1828, the son of Robert Alexander Cameron, Senior, and Maria G. Corwin. Cameron's father was an iron merchant in Brooklyn, at one point forming a partnership with Clark Carrington at 97 Fulton Street in Brooklyn. Carrington also operated a millinery just down the block from Cameron & Carrington at 128 Fulton Street. 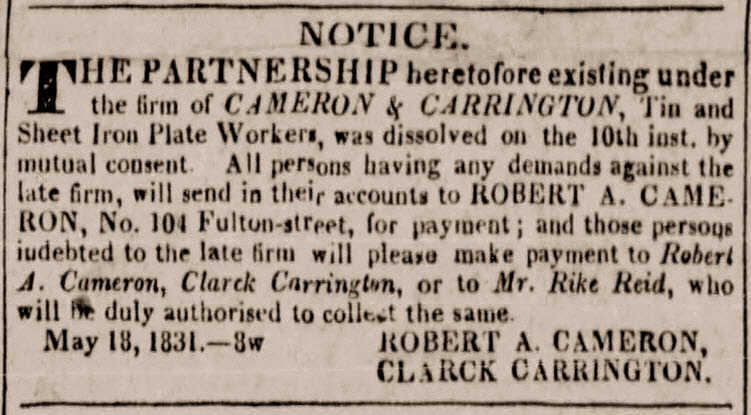 Dissolution notice for the firm of Cameron & Carrington. Source: The Long-Island Star, May 18, 1831. 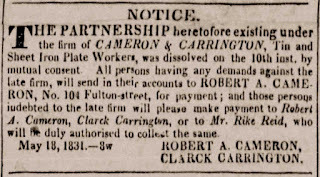 In May of 1831, the partnership of Cameron & Carrington would dissolve. A newspaper notice suggests that Cameron then ventured out on his own immediately after the partnership dissolution, operating his new business at 104 Fulton Street in Brooklyn. The notice also indicates that Cameron would pay cash "for old Rags, Copper, Pewter, Brass and Lead." concerning the establishment of his business. Source: The Long-Island Star, June 1, 1831. Little is known of the early life of Robert Alexander Cameron, Junior. In July or September 1834, Robert's infant sister passed away in Brooklyn at the age of one year and five months. His father passed away the following year, also in Brooklyn, on Tuesday, May 26, 1835, when Robert was seven years old. daughter of Robert A. Cameron. Source: The Long-Island Star, September 4, 1834. Robert's mother would be appointed administratrix of his father's estate, raising at least two children as a widow. The other child was Catherine Maria Cameron, born in Brooklyn on March 21, 1830. Catherine would live a full life, dying at the age of seventy in Oshkosh, Winnebago County, Wisconsin. It is known that Robert, along with his sister Catherine, would move with their mother to Porter County, Indiana, probably around 1838, where he would live his formative years as a "farmer boy." Where Maria, Robert, and Catherine were residing between 1836 and 1838, however, has been lost to history. Published death notice for Robert A. Cameron, Senior. Source: The Long-Island Star, May 28, 1835. Estate administration notice for the late Robert A. Cameron, Senior. Source: The Long-Island Star, September 10, 1835. The move to Porter County was likely motivated by the fact that two of his mother's sisters were already living in the county. His aunt Deborah Corwin had married Charles A. Gregg and they were residing about two miles south of Hebron in Section 27 of Boone Township. Robert's aunt Elizabeth Corwin had married Philo Albert Porter; Philo and Elizabeth were also residents in Boone Township's Section 27, just south of the Gregg family, and had arrived in the county prior to 1838. Though it is unknown exactly where Robert A. Cameron lived with his mother while growing to adulthood in Porter County, it may have been in Boone Township with or near the Gregg and Porter families. Alternatively, Robert may have been raised approximately 1.5 miles directly west of Lake Eliza in Section 3 of Porter Township. Robert's mother would remarry to Ezra Reeve, and Ezra owned land located west of Lake Eliza. The marriage between Ezra, a native of Queens, New York, and Maria is likely to have taken place before Maria moved to Porter County since Ezra and Maria had a daughter, Mary S. Reeve, around 1836. 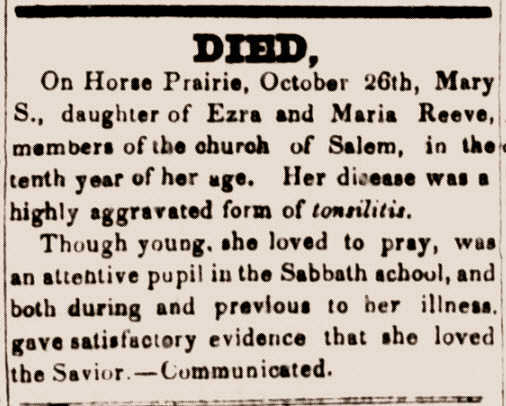 Mary would pass away at the age of ten years on Horse Prairie, north of Hebron in 1847. 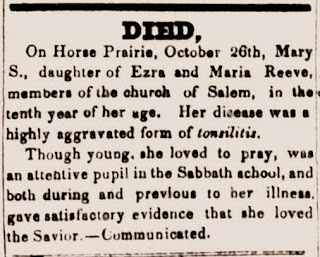 Ezra and Maria would later move to Wisconsin where both would pass away and be buried. step-sister of Robert A. Cameron, Junior. Source: Western Ranger, November 6, 1847. During the Mexican-American War, which took place between 1846 and 1848, it has been written than Robert A. Cameron volunteered his services under Captain Joseph P. Smith of Lake County, Indiana. Smith was formerly a resident of New York City and had moved to Crown Point in Lake County, Indiana, in July 1836. Smith was serving as the County Clerk of Lake County at the outbreak of the conflict, resigning the position to form the Lake County Rangers. The regiment was full, so Cameron's company was not called out for service and, consequently, did not actively participate in the war. It should be noted that a search of military records does not provide evidence that Cameron was officially enlisted as a solider during the Mexican-American War. Captain Smith, however, would serve in the war with the 16th Regiment of Infantry of the United States Army. In 1846, eighteen year old Robert A. Cameron would take up residence in Valparaiso and study medicine under the tutelage of J. L. Stockton, M.D. 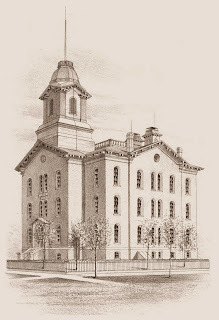 Perhaps with Stockton's encouragement, Robert would enroll at the Indiana Medical College located in nearby LaPorte, LaPorte County, Indiana, where he reportedly "pursued it [his medical studies] with energy and industry, and graduated with honor and distinction" in 1850 with twenty-three other graduates. Among the other twenty-three graduates was William Worrall Mayo, a tailor from Lafayette and later the founder of the Mayo Clinic. 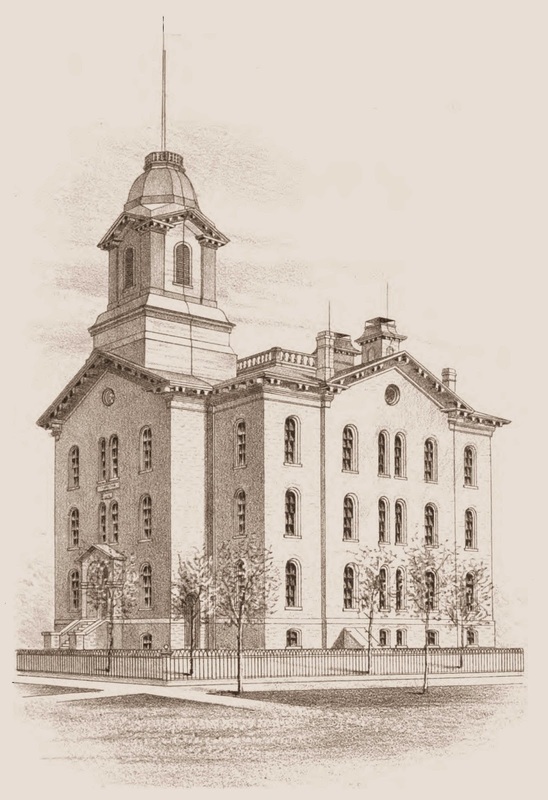 Note that LaPorte's Indiana Medical College, though it would later become defunct, was the first medical school established in Indiana, founded in 1842. Engraving of the Indiana Medical College at LaPorte, LaPorte County, Indiana. Source: C. C. Chapman & Company's History of La Porte County, Indiana,1880. Prior to his graduation, Robert would wed Jane Elizabeth Porter in Porter County on March 27, 1849. Jane's parents were Philo and Elizabeth Porter, Robert's uncle and aunt. Hence, Robert and Jane were first cousins. and his wife Jane Elizabeth Porter. Cameron would establish a medical practice in Valparaiso in 1850, immediately after his graduation from the Indiana Medical College. Politically, Cameron was a Democrat, but he left the party on or soon after May 30, 1854, when the Kansas-Nebraska Act was signed into law by President Franklin Pierce. The Kansas-Nebraska Act effectively repealed the provision of the 1820 Missouri Compromise forbidding slavery in the former Louisiana Territory north of the 36°30' parallel. In May 1854, Cameron became the associate editor of the Practical Observer, one of Valparaiso's early newspapers, which was owned by Judge William Cole Talcott. Cameron would sever his editorship of the Practical Observer in December 1854, presumably to return to his practice as a physician. newspaper listing Dr. R. A. Cameron as Assistant Editor. Source: Practical Observer, August 1, 1854. 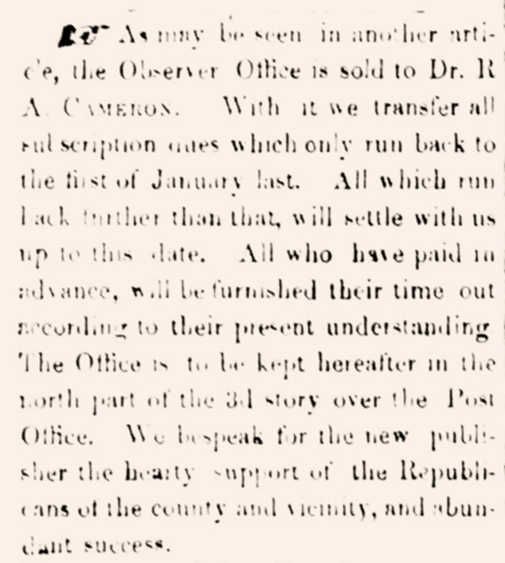 Having been honored by the people of Laporte, Porter and Lake counties with an office which demands the chief part of my time and attention, I have thought it advisable to free myself from the cares and duties of editor and publisher of the Observer, and have accordingly sold the office to DR. R. A. CAMERON, who will henceforth assume the duties of editor and publisher. To those acquainted with the Doctor any words of commendation as to his talent and fitness for the station he now proposes to fill, are superfluous, but to others I will say that I consider him pre eminently the man for such an undertaking, and I believe time will prove the truth of what I say. The paper will undergo improvements in size and mechanical execution, as well as doubtless in editorial management, but will remain the same in political principles that is, unswervingly Republican. 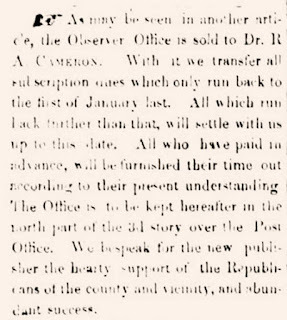 I heartily commend it to the patronage of all our citizens, and must no insist, without any delicacy, that it is the duty and interest of all Republicans in Porter County to take the Observer. I owe a debt of gratitude to my patrons for their indulgence and liberality toward me during the ten years I have been trying to serve them in this capacity, and with a due sense of my obligation a happy consciousness of having discharged my duty to the best of my poor ability, and a kind of solemn feeling of regret upon serving the relation I have so long sustained toward my readers, I bid them farewell. has sold his newspaper to Dr. Robert A. Cameron. Source: Practical Observer, April 7, 1857.
of Valparaiso's Practical Observer newspaper. In December, 1853, the prices of the paper [Practical Observer] became $5 per year for the daily, $1.50 for the semi-weekly, and $1.50 for the weekly. In May, 1854, Dr. R. A. Cameron became associate editor, but severed his connection with the paper in December of the same year. Various changes were afterward made in the prices and forms of the various issues. In January, 1855, Mr. [William C.] Talcott, who had long felt the need of assistance, took in as associate editors Lucius Hawkins and W. B. Talcott, but neither remained long. In April, 1857, R. A. Cameron bought the entire office and outfit, and issued his first number on the 14th of that month. With Vol. I, Number 15, of this series, the name of the paper was changed to the Republican, and the sheet continued an earnest exponent of the principles of the new party from which it derived its name. J. [John] F. McCarthy became associate editor September 19, 1857, but left March 23, 1858, and Thomas McConnell went in with Cameron as joint editor and proprietor. July 15, 1858, Mr. McConnell became simply assistant editor, but on the 29th of the same month purchased the paper conditionally, and took as an associate, Henry W. Talcott. On the 14th of October, 1858, William C. Talcott, the veteran editor, went in with McConnell and H. W. Talcott, as joint editor and proprietor. On the 3d of January, 1859, the Republican under this able management, began a new series, issuing a one-page daily, a four-page semi-weekly, and an eight-page weekly, Henry W. Talcott being publisher and proprietor. 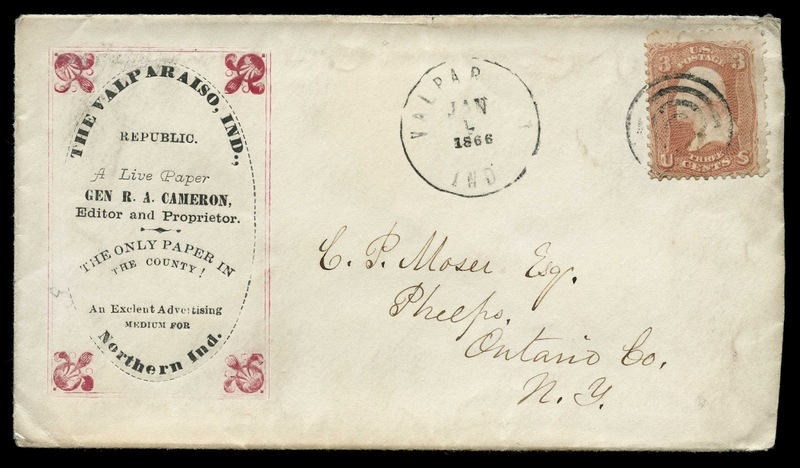 In March, 1859, R. A. Cameron again became owner and publisher, with R. A. Cameron and J. [John] C. Thompson editors. On the 31st of March, the weekly was enlarged, the daily having been discontinued some time before. In September, the last two letters of the paper's name having been lost or stolen during a fire, the name became the Republic. In March, 1860, Mr. Thompson severed his connection with the paper, and on the 25th of April, 1861, with Vol. V, Number 17 (of the Republican and the Republic), E. R. [Edwin Ruthven] Beebe went in as editor and proprietor. Mr. Cameron having sold out and "gone to the war," Thomas McConnell became publisher with Vol. V, No. 31, and on the 1st of August, 1861, the editors became McConnell, Cameron & Beebe. Mr. Cameron was corresponding editor, and sent home long, spicy letters from the field of war. His interest in the paper at this time was owing to the fact that Mr. Beebe could not meet the payments according to the contract. In a short time McConnell bought the entire paper, Mr. Beebe stepped down and out, and Mr. Cameron, who probably held a mortgage on the office, remained corresponding editor. On the 10th of April, 1862, as Mr. McConnell had failed to meet the requirements of the contract of purchase, the ownership of the paper reverted to Mr. Cameron, and Mrs. Jane E. Cameron, wife of the owner, assumed control, with Mr. Beebe as associate editor. Mr. Beebe went out December 11, 1862, and the paper was advertised for sale, though the issues appeared regularly, mainly through the efforts of Mrs. Cameron. 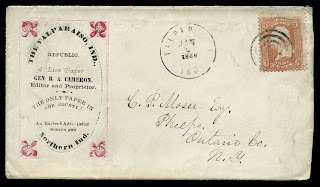 June 18, 1863, Aaron Gurney went in as joint editor, Cameron & Co. publishers, R. A. Cameron corresponding editor, but in December of the same year the issue was discontinued, Mr. Gurney having withdrawn, and the paper having no one to properly manage it. On the 4th of January, 1866, Mr. Cameron having returned from the war, issued No. 1, Volume X, of the Valparaiso Republic, and continued this until May 24, 1866, when Thomas McConnell became joint editor and publisher. In November, 1866, G. A. [Gilbert Ashville] Pierce bought the office, but immediately sold the same to Aaron Gurney, who was issuing the Vidette, and the two papers were merged, and issued under the title of "Vidette and Republic," a nine-column folio newspaper; Aaron Gurney, general editor; B. W. Smith, educational editor, and Pomeroy, Kimball & Co., publishers. The first number of the Porter County Vidette had been issued January 24, 1866, Gurney & Pomeroy, proprietors; Aaron Gurney, general editor, and A. D. Cunningham, editor of the educational department. March 19, 1867, J. F. Heaton went in with Gurney as joint editor, and, in May, Kimball became joint proprietor with Gurney. August 27, 1867, Mr. Heaton left, Gurney continued sole editor, and the paper was reduced in size, and thus remained until July, 1868. Mr. Pierce, after buying the Republic and immediately selling it to Mr. Gurney, issued during the same month, November, 1866, the first number of the Republican, a new venture, or perhaps a continuation of the old Republic, with J. Harper, associate editor, and Orrin E. Harper & Co., publishers. April 4, 1867, G. A. May became joint editor, but went out October 31, 1867, as also did J. Harper. About this time, W. H. Calkins became associate editor, but on the 5th of March, 1868, left, and in July, 1868, the Republican was consolidated with the Vidette and Republic under the latter name, Gurney & Pierce, editors and proprietors. Not long after this, Mr. Pierce sold out to Mr. Gurney, who continued to issue the paper until June 4, 1874, when the office was bought by William C. Talcott, who, two issues later, changed the name to Vidette, and thus it has remained until the present. December 1, 1874, C. R. Talcott secured a half-interest, and the paper was continued thus with abundant success until November, 1879, when C. [Charles] R. Talcott bought his father's interest and assumed exclusive management, but December 16, 1880, William C. Talcott repurchased a half interest, and thus the paper remains at the present writing. It is well documented that Cameron had fully embraced his profession as editor of a newspaper. For instance, on June 14,1859, Cameron and newspaper editors from nearby LaPorte organized the first convention of northern Indiana newspaper editors at Westervelt's Hall in Plymouth, Marshall County, Indiana. At least thirty-five editors attended this meeting. The purpose of the meeting of newspaper editors was to agree on practices, conduct, and courtesies extended to one another, irrespective of political party affiliation. Minutes of the meeting note that the editors fully realized the amount of influence they could have on their readers and local communities. Agreement was also made concerning how subscriber accounts should be handled, an activity that would violate antitrust law today. Editors agreed to lobby the state legislature to provide for the publication of all laws that affect Indiana citizens in all state newspapers at such a fee as determined by the legislature. The editors also established "that patent medicine advertisements should be charged the same rates as local advertisements, and pay in advance exacted," which would also violate today's antitrust laws as collusive price-fixing. While the meeting among northern Indiana newspaper editors may not seem all too important from a historical context, it did allow Cameron to personally interact with some rather powerful men. For instance, Schuyler Colfax was an attendee at the meeting, representing the St. Joseph Valley Register. At this time, Colfax was also representing the citizens of Indiana in the United States House of Representatives. Four years later Colfax would serve as Speaker of the House, a position he held from December 7, 1863, to March 3, 1869, when he became Vice President of the United States under President Ulysses S. Grant. As a representative he is dignified and courteous. In argument he is clear and dispassionate, never attempting a speech unless fully versed in the subject under discussion. He has been educated in the school of self-reliance, and must be justly recognized as a self-made man in the fullest sense of the term. His personal appearance is commanding, and when addressing the House he never fails to elicit the warmest commendations from all who come within the range of his voice, which is full, clear and musical. He is a man of the people, and as such is devoted to their interests, which he watches with a jealous eye and is always one of the first to be heard when the right of the people are sought to be assailed by special legislation for the benefit of corporate monopolies. This is his first term in any Legislative Assembly, and well did he sustain the confidence reposed in him by his constituency. Of his ability and integrity they had a just appreciation, and his legislative efforts are untarnished by the least infraction of honor or duty. Fortunate are any people who choose a man as R. A. Cameron as their Representative in any capacity. Inured to toil from his early boyhood his votes, his speeches and his acts are ever for the right of the people - in favor of free homes, and above all, for free schools. 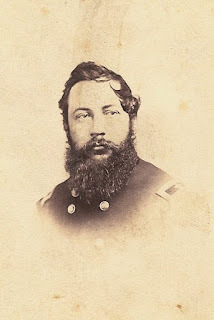 At the outbreak of the Civil War, Cameron enlisted on April 17, 1861, for a three month service term with Company H of the 9th Indiana Volunteer Infantry where he was chosen as captain of the company on April 23. Porter County residents Colonel Pierce and Colonel Suman also served in what was referred to as the Bloody Ninth. While Cameron was serving as an officer during the Civil War, his wife Jane remained in Valparaiso and served as an editor of his newspaper, the Republic, until her death on November 17, 1863, in Valparaiso. Cameron would write weekly letters to the Republic during the conflict to keep subscribers informed about the activities associated with the war; he continued this practice after Jane's death. A touching story concerning Jane Cameron involves Porter County resident John W. Lyons. Lyons had enlisted for military service and was sent to Camp Morton at Indianapolis with his unit, Company H of the 9th Indiana Volunteer Infantry, for training; Robert A. Cameron was also serving with Company H. Lyons would die of rubella (German measles) at the Camp Morton General Hospital on June 9, 1861. A telegram was sent to Marquis L. McClelland at Valparaiso from the commandant of Camp Morton informing him that Lyons' body would be shipped to Valparaiso for final disposition. McClelland was not familiar with any John W. Lyons in Porter County and Lyons' name was not found on a Porter County enrollment register. McClelland replied with a telegram to the commandant indicating that he believed that there was a mistake in sending Lyons' remains to Valparaiso. The commandant responded that Lyons had enrolled at LaPorte and listed his residence as Jackson Township in Porter County. The body of a young man named John Lyon, from Jackson township, who died yesterday at Camp Morton has been shipped in care of Capt. McClellan for interment. Since the young man has neither family nor relatives, will some good citizen meet the train tomorrow, with proper conveyance, and give this orphan soldier an appropriate burial? It has been reported that over 1,000 citizens appeared at the railroad depot when Lyons' flag-draped casket arrived in Valparaiso. The Valparaiso community band, with black-draped instruments, attended and brought along a light wagon to convey Lyons' remains. A procession of citizens, standing four abreast, then followed the wagon to the courthouse while the band played a "muted funeral march." Black bunting had been erected at the entrance of the courthouse and Lyons' body would lay in state there for the remainder of the day with an honor guard composed of local residents. The following day, Presbyterian clergyman Reverend Samuel C. Logan presided over Lyons' funeral service. Local educator Chauncey Moore also spoke at the funeral. Lyons' remains were buried in the Union Street Cemetery in Valparaiso where Abraham Asher, a Jackson County resident, "committed the body to the earth with a few Bible verses." He may have been without family or relatives, but he was not without friends. We felt that he was a symbol, for it is not impossible that our sons, or husbands, or fathers may fall on some distant battlefield, and of necessity become a casualty in a mass burial. We turned out to honor this soldier. The service and procession was the largest ever witnessed in Porter County. When Jane Cameron passed away in 1863, she, too, was buried in the Union Street Cemetery. After serving his required three months service term, Cameron, like a great number of Porter County men, would reenlist for service. On July 19, 1861, Cameron would muster into the 19th Indiana Volunteer Infantry, where he was promoted to lieutenant colonel. The 19th Indiana Volunteer Infantry was one of the five regiments that composed the legendary Iron Brigade, the others regiments being the 24th Michigan Volunteer Infantry and the 2nd, 6th, and 7th Wisconsin Volunteer Infantries. The brigade was noted for the appearance of their uniforms, particularly their black hats, as well as their discipline and tenacious fighting ability. The Iron Brigade experienced the highest percentage of casualties of any brigade in the war. On February 3, 1862, Cameron would be transferred to take command of the 34th Indiana Volunteer Infantry, and on June 15, 1862, he was promoted to colonel. It was reported in many newspapers that Colonel R. A. Cameron had been killed at the Battle of Champion's Hill on May 15, 1863; this was the pivotal battle in the Vicksburg Campaign resulting in the death of 791 men and the wounding of 2,862. Cameron had not died, but he had been injured when a shell had exploded near him, causing injury to his eyes. The injury resulted in a brief furlough to Valparaiso for recovery and permanent eye damage. Cameron would remain in command of the 34th Indiana Volunteer Infantry until he was promoted to brigadier general on August 11, 1863. Brigadier General Cameron would command of the 1st Brigade, 3rd Division, 13th Corps of Volunteers from October 3, 1863, to December 6, 1863. Service records indicate that Cameron was granted leaved from service from December 6, 1863, to January 6, 1864. This furlough was likely due to the death of Cameron's wife in mid-November and his responsibility to attend to the immediate needs of his young daughters. Military records also reveal that Cameron was detached from service from January 6, 1864, to February 1864, perhaps receiving an extension of his furlough. In February 1864, Cameron had returned from his leave and was back in command of the 1st Brigade, 3rd Division, 13th Corps of Volunteers. On June 9, 1864, Brigadier General Cameron was placed in command of the Lafourche District in the Department of the Gulf. He would remain in command of this district until the end of the war. Rather than remain in service, Cameron resigned June 1, 1865, and mustered out of service on July 10, 1865; he returned to Valparaiso. One source indicates that Cameron's administrative load was quite high and was likely the motivation for his resignation. to Brigadier General Lorenzo Thomas, June 1, 1865. Publication No. M1064, Record Group 94, Roll No. 0078. 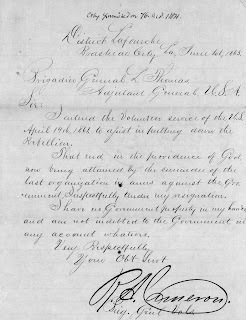 On January 6, 1866, from Valparaiso, Robert A. Cameron wrote a letter to the United States Secretary of War, Edwin M. Stanton, requesting a promotion from brigadier general to brevet major general. A brevet is a warrant that confers a commissioned officer a higher rank for meritorious conduct, but does not confer additional military authority, precedence, or increased pay. Sir;- I have served in the Volunteer Army of the U.S. since the breaking out of the Rebellion, having enlisted Apr. 17th 1861, and remained until the close of the War, after Kirby Smith's surrender. I enlisted as Captain in the 9th Ind. and passing through the grades of Lieut. Col. and Col. was appointed a Brig. Gen. by Abraham Lincoln, Aug. 11, 1863, at the request of Gen. Hovey, endorsed by Gen. Grant, for bravery and success at the Battle of Port Gibson. I have served under Gen. McClellan in Western Virginia, under McDowell and McClellan in the Army of the Potomac, under Nelson in Kentucky, under Pope in Missouri, under Curtis in Arkansas, under Sherman in Tennessee, under Grant in Mississippi, and at Vicksburg, and under Banks and Canby in the Dept. of the Gulf. I participated in the engagements at Philippi, Lamel Hill and Carricks ford in Western Va., in the two engagements at Lewinsville, Eastern Va., at the siege of New Madrid, Mo. several minor engagements in Arkansas, in the battle of Port Gibson, Champion Hill, and the siege of Vicksburg, Miss., in the engagements at Opelousas, Carrion Crow Bayou, and Spanish Lake in Louisiana. I commanded the 3d Div. of the 13th Army Corps at the battle of Sabine Cross Roads, and the whole of the 13th Corps present (two divisions) at the Battle of Monett's Ferry, La., and several other engagements in Bank's Red River Campaign. From the close of this campaign until my resignation at the close of the War, June 1865, I commanded the District of Lafourche, La., covering New Orleans, having at one time fourteen thousand men under my command. During all the period of my military life, I never incurred the displeasure of my superior officers for any lack of duty. I was never court-martialed, under arrest, or had any charged preferred against me. On retiring from the service I received a voluntary testimonial letter from Brev. Maj. Gen. Sherman, commanding Southern Div. of La., endorsed by Maj. Gen. Canby, then commanding Military Div. of the South-West, a copy of which I enclose. With this record, I would ask of the Government, through you, the compliment extended to so many of my brother officers, a Brevet Promotion. For my private character and standing, I will refer you to Hon. Henry S. Lane, our Senator, or to Hon. O. P. Morton, Governor of this States, were he in this country. New Orleans July 9th 1865. 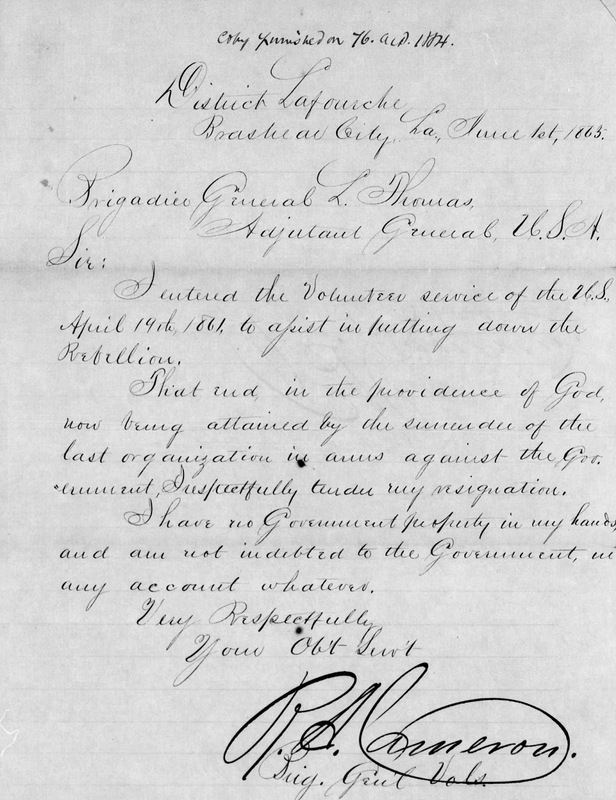 Having seen fit to resign your commission and retire to private life at the close of the contest in which you have been so actively engaged, I cannot omit to tender you my humble appreciation of your services during the past twelve months, for which time you have served under my command in the capacity of commanding General of the district of Lafourche. That district has never been so well commanded as during your administration. Though threatened by the enemy on several occasions, all serious attack has been prevented - owing to the vigilance you have exercised, and the prompt and industrious system of espionage and scouts you have maintained. Considering that you have some of the very worst regiments among those of your command you have nevertheless maintained discipline in a satisfactory manner. The most of your district is inhabited by some of the worst class of secessionists, who have constantly moved heaven and earth to circumvent the Orders and the Policy of the General Government. You have successfully suppressed all overt acts by the influence of your watchfulness, untiring industry, and by the prompt application of the laws of War in trials and punishments by Military Commission. You leave me fully impressed with the qualities of a successful division and district commander. It is to be regretted that your services cannot be had for a few months longer, until the political hostility of the inhabitants is more completely crushed, or until the new order of things becomes more decidedly pronounced. But fully appreciating your patriotic motives for entering the service, I as fully appreciate the promptness with which you desire, after the war is over, to return to civil life for the amendment of your personal interests, already suffered so much from your long absence. Wishing you, my dear General, perfect success and happiness wherever you go, and in whatever you may undertake hereafter, believe me. Cameron's request for promotion was granted, and it was ante-dated to March 13, 1865, when he was still in active service with the Army. He could now be referred to as Major General Cameron. For the remainder of his life, Cameron would consistently use the title of General in his correspondence. New York, postmarked June 4, 1866. Cameron's return to Valparaiso upon resigning from the military was somewhat brief. As previously mentioned, Cameron sold the Republic newspaper in November 1866 to Colonel Gilbert A. Pierce. He would then establish drug business in town and practice as a physician. 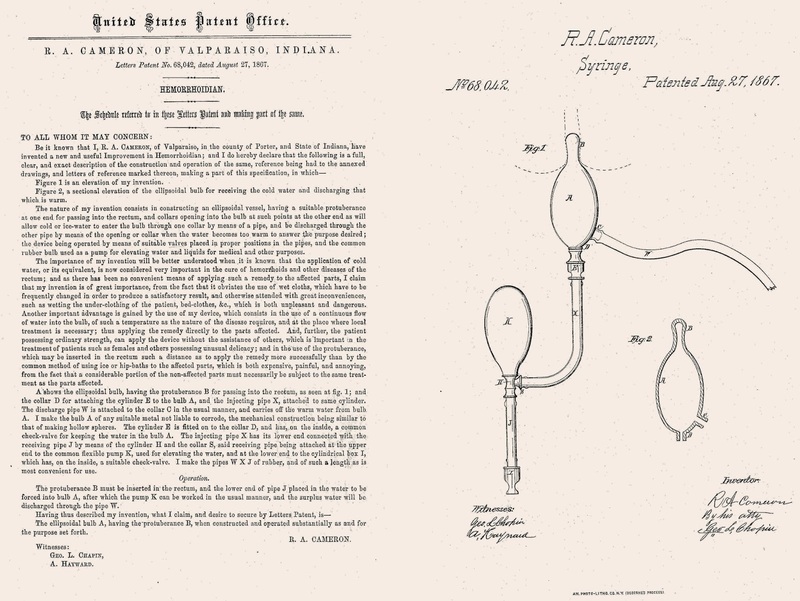 On August 27, 1867, Cameron could add "inventor" to his list of accomplishments when the United States Patent Office awarded him patent for a syringe apparatus called a hemorrhoidian, a medical device used to treat hemorrhoids (U.S. Patent No. 68,042). 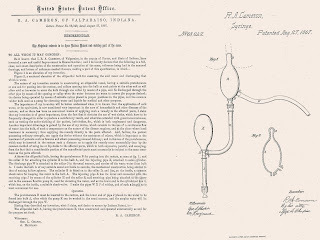 device invented by Robert A. Cameron. Source: United States Patent and Trademark Office. Around 1868, Cameron left Valparaiso and established himself as a physician at Phelps, Ontario County, New York. While residing in New York, Cameron affiliated himself with several promoters of migration to the far west. In particular, he aligned himself with Nathan Cook Meeker, the agricultural editor of the New-York Tribune, and Horace Greeley, the publisher and editor of the New-York Tribune. Horace Greeley is noted for popularizing the phrase "Go West, young man, and grow up with the country." Greeley would also run for president in 1872 on the Liberal Republican ticket, coming in second to incumbent Republican Ulysses S. Grant (3,597,132 to 2,834,125). The 1872 presidential election was rather interesting in that the first and second positions in the election were won by Republicans, as well as the fact that Greeley died soon after the election and before the Electoral College could vote. Hence, Greeley's electoral votes were not counted. It is the only presidential election where a candidate died before the electoral vote could take place. Obviously, Cameron had associated himself with a rather powerful man in Horace Greeley. On December 4, 1869, a notice appeared in the New-York Tribune concerning a colonization plan. On December 23 a meeting was held at the Cooper Institute Building in New York where the colony plan was discussed among the numerous attendees. The name of Union Colony was adopted and the new association elected Nathan C. Meeker as president, Robert A. Cameron as vice-president, and Horace Greeley as treasurer. Another five men were elected to serve on the executive committee with Meeker, Cameron, and Greeley. The executive committee of the Union Colony quickly drew up a constitution, which was adopted on December 27. Membership in the Union Colony was open to men of good character who supported temperance. The initiation fee was $5 and membership into the Union Colony was $150. Funds collected were used to defray the expenses associated with selecting and purchasing land for the colony in the far west. Each colony member would be entitled to a parcel of farming land outside of the chosen town site and a town lot ranging in price from $25 to $50. Land would then have to be improved within one year for title to be deeded to the colony member. Proceeds from the sale of town lots was to be used for the erection of a school building, town hall, and other town improvements. On January 3, 1870, Nathan C. Meeker, Richmond Fisk, and Robert A. Cameron were chosen by the Union Colony membership as the locating committee for the new community. They would leave New York for the West on February 3, joined by H. T. West of Chicago at Omaha. They eventually found land in the Cache a la Poudre valley quite favorable. The town of Evans in Weld County was nearby and it served as the terminus of the Denver Pacific Railway. The locating committee would purchase land from a subsidiary of the railway, the Denver Land Association. Meeker and Cameron, on behalf of the Union Colony, would purchase 9,324 acres from the Denver Land Association and another 2,592 acres from private individuals. Another 60,000 acres of government land was filed upon and fees paid by the Union Colony so as "to prevent uncongenial neighbors." The organization was incorporated in Colorado as The Union Colony of Colorado, and the town that they established was named Greeley. From 1870 to 1878, Cameron would heavily invest himself in the development and growth of Greeley, as well as practice medicine. Within this time frame, Cameron was also instrumental in the founding of other colonies in Colorado. He assisted in the establishment of the Fountain Colony and its town, Colorado Springs. He was a co-founder of the Agricultural Colony of Fort Collins and its town, Fort Collins. Finally, Cameron was instrumental in the founding of Manitou Springs, Colorado, which was to be developed into a scenic health resort. The communities that Cameron assisted in organizing proved to be great successes. 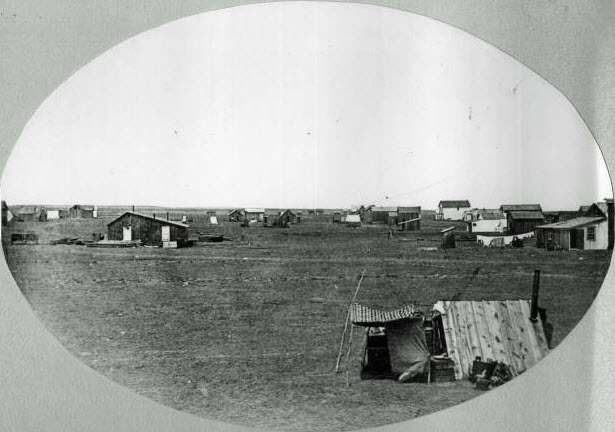 The Union Colony, Greeley, Weld County, Colorado, 1870. Source: City of Greeley Museum. Cameron, a widower for several years, would wed Clara Ellen Flower. Though no marriage record can be found, it is believed that the ceremony took place in the Territory of Colorado in 1869. This suggests that Cameron may have been instrumental in having the Union Colony choose Colorado as a place for colonization. Clara was born on January 8, 1840, the daughter of James B. Flower and Mary Hoyt (Pardee) Flower. Clara and her sisters were reportedly referred to by citizens of Greeley as the "Flower Girls." When Greeley was founded, Cameron and his father-in-law, James B. Flower, would form a partnership and select a prime real estate location in the town to establish a store called Flower & Cameron. Records suggest the store specialized in dry goods and drugs. The Union Colony's establishment was extremely aggressive and quite successful. Within six months of its founding, the colony was composed of 375 houses and a population of more than 1,000, about 250 of these individuals being children. On May 29, 1871, by order of the Weld County Commissioners, Greeley became an incorporated town and Cameron was appointed as one of the trustees of the community. Cameron also served as postmaster for the community, a position he resigned from in 1871 due to his absences resulting from assisting in the establishment of other colonies in Colorado. The deficiency of the General's sight, impaired in the army, has not been for them wholly a misfortune, for it has brought it about that Mrs. Cameron has become for him largely the medium for his reading and study. Hence to some extent she has been to him for eyes. Cameron was also known to be an advocate for the woman's suffrage movement. When the First General Assembly of the State of Colorado met in 1877, a proposition was brought before the voters of the state to determine whether women would have the right to vote. On February 18, 1877, the Woman Suffrage Association of Colorado would meet and Cameron would become a member of the organization's executive committee. The proposition brought forth by this association was rather simple: "Shall the right of suffrage be extended to the women of Colorado?" The proposition for allowing women to vote in Colorado was defeated in 1877. However, the establishment of a strong suffrage organization yielded fruit in 1893 when women of Colorado were allowed to vote. However, it would be another 27 years before the women of the state could vote in national elections. During the early 1880s, Robert A. Cameron had been appointed as a United States Postal Inspector, serving in the law enforcement arm of the United States Post Office Department as a railway inspector. Cameron's most prominent case involved Billy LeRoy, whose real name was Arthur Pond. LeRoy, a stagecoach robber in the southwest who was known nationwide for his crimes, was caught by Cameron with the assistance of United States Marshals. LeRoy would escape from prison, however, and soon be captured again to be imprisoned at Del Norte, Rio Grande, Colorado. It was at Del Norte that LeRoy would be forced to stretch rope when a group of town vigilantes hauled him from the local jail and hung him from a cottonwood tree on May 23, 1881. Interestingly, Cameron was not well-liked by many of the residents of Rio Grande County. Cameron was intent on recapturing LeRoy and sending him to Denver for imprisonment and eventual trial. When Cameron had arrived at Del Norte knowing that LeRoy was in the immediate vicinity, the local populace purposely misdirected him and sent him on a wild goose chase. Why? The locals preferred the vigilante form of justice for LeRoy. Cameron would also be involved with several robbery cases concerning Dirty Dave Rudabaugh. Rudabaugh earned his moniker given that he rarely bathed and wore filthy clothing. His life of crime began in the 1870s where he formed a gang of thieves and cattle rustlers in Texas. His reputation as a bandit increased considerably when he became the leader of the Dodge City Gang. In 1880, Rudabaugh would join forces with Billy the Kid. It has been written that the only man that Billy the Kid truly feared was Dave Rudabaugh. Rudabaugh would eventually be captured with Billy the Kid and his gang on December 23, 1880, and taken to Santa Fe, New Mexico. Rudabaugh would then be removed to Las Vegas, San Miguel County, New Mexico, where he was charged with a capital offense and found guilty. He was sentenced to execution but escaped from prison in November 1882 and crossed into Mexico. Meanwhile, Billy the Kid had escaped jail at Lincoln, Lincoln County, New Mexico, on April 28, 1882, and was later killed by Pat Garrett on July 14, 1881, in a shootout. Cameron would be appointed warden of the Colorado State Penitentiary at Cañon City in 1885, a position he held till 1887. Here, Cameron would establish his final home. He would plant a rather large number of fruit-bearing trees and vines on his property on the outskirts of Cañon City and operate a fruit farm. In 1888, Cameron took a position that had somewhat similar duties as his work in developing colonies in Colorado; namely, he was tasked with increasing settlement into the lightly populated Texas panhandle region as Commissioner of Immigration for the Denver, Texas & Fort Worth Railroad. This railroad would soon be acquired by the Union Pacific, Denver and Gulf Railway Company 1890. With increased immigration would come increased traffic on the rail line extending from Fort Worth to Denver. During the second week of July of 1888, Robert A. Cameron was in Fort Worth, Tarrant County, Texas, serving as permanent chairman of the Deep Water Convention. The purpose of the convention was formalize lobbying efforts for a deep water port in Texas to serve the southwestern portion of the United States. Hundreds of delegates attended the convention from the states of Arkansas, Colorado, Iowa, Kansas, Louisiana, Minnesota, Nebraska, New Mexico, and Texas. Individuals serving shipping and railroad interests were especially attracted to the idea of developing a deep water port along the gulf coast of Texas. Such a port would expand their markets and reduce their current costs of operation in serving the southwestern United States. Despite his busy efforts in the southwestern United States, Robert A. Cameron remained active with his comrades from the Civil War. On October 1, 1888, Cameron attended his first and only reunion with the 34th Indiana Volunteer Infantry at Portland, Jay County, Indiana. Soon after this reunion, on February 22, 1889, Cameron was chairing a meeting of veterans of the Civil War's Vicksburg campaign at Indianapolis. Indiana Governor Alvin P. Hovey, who, like Cameron, was brevetted as a Major General for his meritorious service during the Civil War, was elected president of the newly organized Society of Vicksburg. The purpose of the society was unlike many Civil War-related organizations, which tended to operate more as fraternal societies. Instead, the Society of Vicksburg was formed specifically to demand a revision of the veteran's pension law and the payment of pensions based on gold. The organization was essentially a lobbying group for veterans. Robert A. Cameron would pass away peacefully at 2:00 am on March 15, 1894, at his home on his fruit farm in Cañon City, Fremont County, Colorado. His remains would be interred in the Greenwood Cemetery of Cañon City. Mount Cameron, a 14,238-foot high mountain in Colorado, is named in honor of General Cameron, as is the 10,276-foot Cameron Pass between Jackson and Larimer counties in that state. I extend my sincere thanks to Steve Mockler for providing me informative background material concerning Major General Cameron. Boyd, David. 1890. A History: Greeley and The Union Colony of Colorado. Greeley, Colorado: The Greeley Tribune Press. 448 p.
Dugan, Mark. 2007. Bandit Years: A Gathering of Wolves. Santa Fe, New Mexico: Sunstone Press. 132 p.
National Archives and Records Administration. 1861-1865. Registers of Deaths of Volunteers, Compiled 1861-1865. Records of the Adjutant General's Office. Record Group 94. Washington, D.C.: National Archives and Records Administration. Robarts, William Hugh. 1887. Mexican War Veterans. A Complete Roster of the Regular and Volunteer Troops in the War between the United States and Mexico, from 1846 to 1848. Washington, D.C.: Brentano's. 80 p. [see pp. 32-33]. Spooner, Alden. 1829. Spooner's Brooklyn Directory, for the Year 1829. Brooklyn, New York: Alden Spooner. Willard, James F. 1918. The Union Colony at Greeley, Colorado, 1869-1871. University of Colorado Historical Collections, Colony Series, Volume I. Boulder, Colorado: University of Colorado. 412 p.
Zerfas, L. G. 1934. Medical Education in Indiana as Influenced by Early Indiana Graduates in Medicine from Transylvania University. Indiana Magazine of History 30(2):139-148. The Long-Island Star, Brooklyn, Kings County, New York; May 18, 1831; Volume 22, Number 50, Page 3, Column 6. Column titled "Notice." The Long-Island Star, Brooklyn, Kings County, New York; June 1, 1831; Volume 22, Number 52, Page 1, Column 1. Column titled "Removal." The Long-Island Star, Brooklyn, Kings County, New York; September 4, 1834; Volume 26, Number 13, Page 3, Column 4. Column titled "Died." The Long-Island Star, Brooklyn, Kings County, New York; May 28, 1835; Volume 26, Number 51, Page 3, Column 2. Column titled "Died." The Long-Island Star, Brooklyn, Kings County, New York; September 10, 1835; Volume 27, Number 23, Page 4, Column 3. Column titled "Notice." Western Ranger, Valparaiso, Porter County, Indiana; November 6, 1847; Volume 4, Number 16, Page 1, Column 4. Column titled "Died." Practical Observer, Valparaiso, Porter County, Indiana; August 1, 1854; Volume 2, Number 31, Page 1, Column 1. Practical Observer, Valparaiso, Porter County, Indiana; April 7, 1857; Volume 5, Number 14, Page 4, Column 1. Column titled "Valedictory." The Indiana State Sentinel, Indianapolis, Marion County, Indiana; November 6, 1861; Volume 21, Number 24, Page 3, Column 2. Column titled "Military Hospital." Chicago Tribune, Chicago, Cook County, Illinois; June 6, 1863; Volume 16, Number 298, Page 1, Column 1. Column titled "The News." Fort Wayne Daily Gazette, Fort Wayne, Allen County, Indiana; March 1, 1882; Volume 18, Number 193, Page 4, Columns 4-5. Column titled "Prince of Highwaymen. A Man Who Has Not a Peer Even in the Tales of Turpin Romance." Porter County Vidette, Valparaiso, Porter County, Indiana; February 28, 1884; Volume 28, Number 9, Page 4, Column 3. Column titled "The County. Hebron." Weekly Graphic, Kirksville , Adair County, Missouri; October 2, 1885; Volume 6, Number 24, Page 1, Column 4. Column titled "Stark Nurseries, Louisiana"
Austin Weekly Statesman, Austin, Travis County, Texas; July 19, 1888; Volume 17, Number 34, Page 1, Columns 1-2. Column titled "Deep Water. Texas and the Great New West Resolves to Have a Big Seaport." Austin Weekly Statesman, Austin, Travis County, Texas; July 12, 1888; Volume 17, Number 33, Page 1, Column 3. Column titled "Fort Worth. Assembling and Organization of the Deep Water Convention." Los Angeles Daily Herald, Los Angeles, Los Angeles County, California; February 23, 1889; Volume 31, Number 143, Page 4, Column 6. Column titled "Veteran of Vicksburg." The Pittsburgh Post, Pittsburgh, Allegheny County, Pennsylvania; February 23, 1889; Volume 48, Number 140, Page 5, Column 6. Column titled "Society of Vicksburg." The Fort Worth Daily Gazette, Fort Worth, Tarrant County, Texas; March 16, 1894; Volume 18, Number 113, Page 6, Columns 2-3. Column titled "Gen. Cameron Dead." The Daily Inter Ocean, Chicago, Cook County, Illinois; March 17, 1894; Volume 22, Number 356, Page 2, Column 7. Column titled "Work of the Silent Reaper. General Robert A. Cameron." The Indianapolis Journal, Indianapolis, Marion County, Indiana; March 17, 1894; Volume 46, Number 32, Page 2, Column 3. Column titled "Indiana Deaths. Gen. Robert A. Cameron Dies at Canon City, Col."
Huntington Herald, Huntington, Huntington County, Indiana; March 27, 1894; Volume 46, Number 32, Page 2, Column 5. Column titled "A Hero Gone." Pittston Gazette, Pittston, Luzerne County, Pennsylvania; September 5, 1907; Volume 57, Page 6, Columns 1-3. Column titled "Venerable Man Has Passed Away. Rev. Dr. Logan, of Scranton, Died Yesterday Afternoon, at a Ripe Old Age. " The Vidette-Messenger, Valparaiso, Porter County, Indiana; December 30, 1930; Volume 4, Page 1, Columns 2-3. Column titled "Only Four Left of Company H, Civil War Unit That Left Here for Battlefields of Virginia." The Vidette-Messenger, Valparaiso, Porter County, Indiana; November 11, 1957; Volume 31, Number 110, Page 1, Column 3 and Page 3, Column 5. Column titled "Unknown Soldier Honored," by The Stroller [William O. Wallace]. Thanks for the great story. You probably know that Union Colony was an outgrowth of the Temperence movement, and Greeley remained a dry city until 1972. I live in Colorado Springs & was unaware of his contributions. Thanks for the comment. I was aware of the temperance movement with regard to the Colorado colonies. Horace Greeley (and his newspaper) was a major mouthpiece for the movement. If you're interested in reading a detailed history of the Union Colony, then I suggest the two books below that are available for free on archive.org. Both are very interesting to read with regard to how the colony was organized, planned, and established.